If you have additional questions, please do not hesitate to ask. The title of the wedding bands refers to the symbolic meaning of memengwaa or butterfly – its stylized design visible in the interiors of both rings – in combination with the age-old symbol of the Midewiwin Life Road, which the jeweler depicted in the exteriors of the bands. This capriciously stylized road with seven side roads or digressions symbolizes the life path of two persons who share their joys and sorrows with each other. The dancing menengwaag on the insides of the rings show the married couple the way through the curves of Life and guide them around pitfalls and barriers that they individually and as a couple encounter along the way. But above all, the dancing Menengwaag remind them how important it is not just to know how to walk, but how to walk together – and even run together (strive hard) if need be in order to keep their marriage healthy and strong and – in a broader sense - to keep their family and their People well. 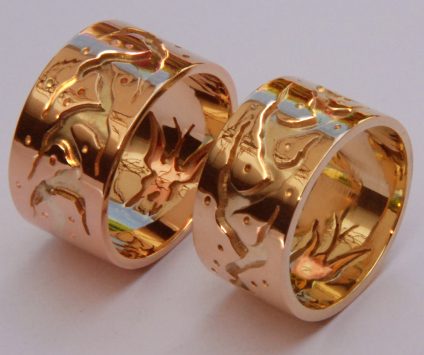 Visit our art blog to read more about the symbolic meaning of these wedding rings - and to enjoy the amazing story of how Wiinabozho created the butterflies!